Rock N Learn is an award winning company that makes learning DVDs for children. 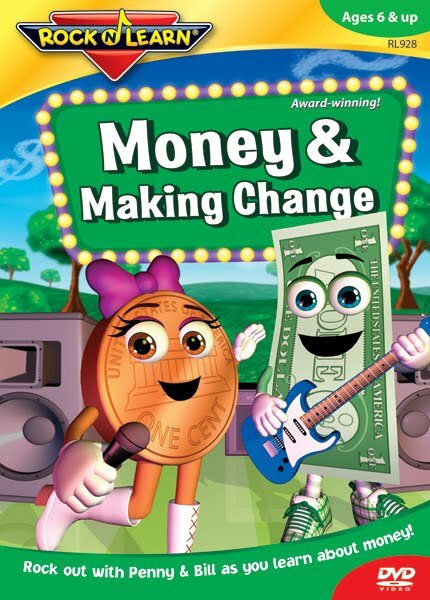 In Money & Making Change, Penny and Bill rock out to music as they learn about counting money and making change. Designed for children six and up, this DVD really helps kids learn about money and its value while having fun, playing games, and listening to entertaining music. In this 57 minute DVD, Penny and Bill learn about coins, how they relate to each other, strategies for counting money, how to make change, and more. Just as with the other DVDs by Rock N Learn, the graphics are cheesy in my opinion but kids seem to love them. Both my boys, 9 and 3, were interested in the movie and left telling me things they learned. We were very pleased with their Phonics series, and the Money & Making Change didn’t disappoint either. You can buy Rock 'N Learn’s Money & Making Change DVD on their website, www.rocknlearn.com. It retails for $19.99. Through December 5th, you can receive 25% off your order when you check out using Code: SSA25. Thank you to Rock 'N Learn for sending us a complimentary product sample to base this review upon.